Has anyone started watching the new season of Master Chef USA? You know me, I love my cooking competition shows. Okay I pretty much love all things TV, but Master Chef has been one of my favorites since it started a few years ago. Maybe it’s the British origin or the fact that it’s the show I’ll watch and think, hey that’s a show I could actually apply for. Unlike Top Chef or the likes, where I would be chewed up and spit out, Master Chef is non-professionals competing to be the best, get a cookbook, not to mention a hefty cash prize. That’s right up my alley! Still not sure being on reality TV of any sort is my bag though. Confession here- I did actually apply (unsuccessfully) for The Next Food Network Star back in the second season. You know, the year that Guy Fieri won… Don’t get me started. One of the reasons I love this show is the variety of challenge styles that get my culinary creative juices flowing, thinking about how I would approach the mystery boxes, perfect the pressure tests, and cater the massive crowds during the team challenges. Some great ideas have come from these brainstorms. On a drive all the way to Canada with a friend (okay, from Rochester, NY but still), we determined our competition entries for almost every episode of the current season. Out of that we mentally created an apricot and goat cheese chicken, which turned out to be an amazing dish. I should make that again, come to think of it. 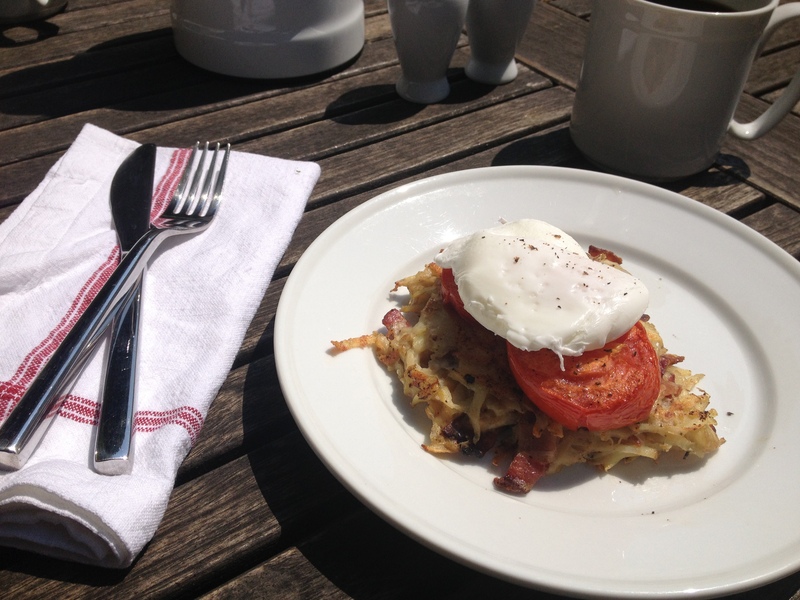 A bacon filled crispy hash brown with roasted tomatoes and poached eggs. Wouldn’t this be perfect for a Father’s Day Brunch!? Reminder everybody- Sunday is Father’s Day!! 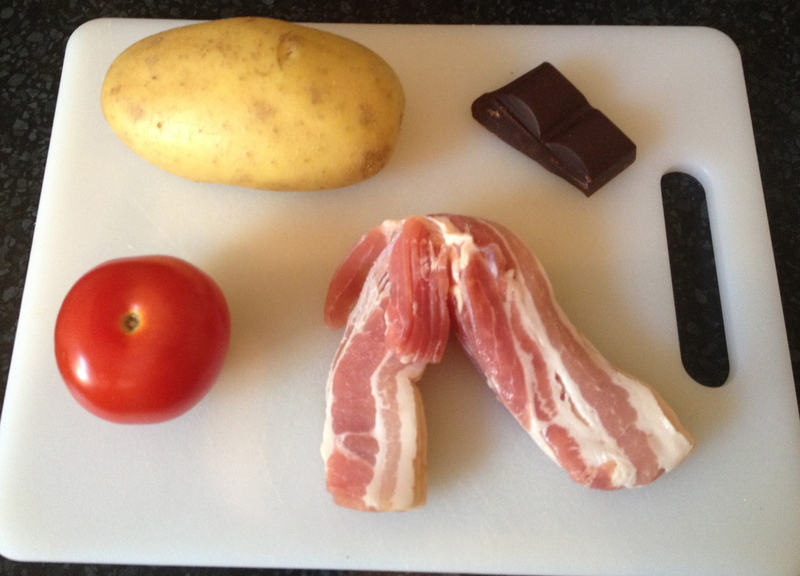 If you’re looking for an impressive manly meat and potatoes dish to cook up for dear old dad, this one’s a winner. I won’t get to see my dad until his visit in September but I’ll consider this an IOU because it’s a definite make-again recipe. In the spirit of competition, I gave myself the same time constraints that they had on the show to make this, 60 minutes, which was plenty of time as long as you get started immediately on the tomato and potato. 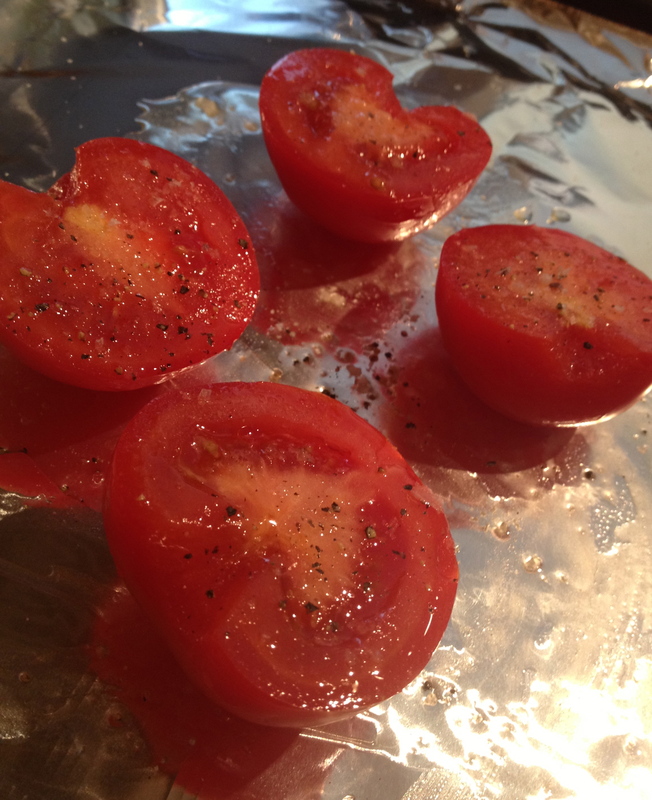 First preheat your oven to roast your tomatoes. I always wonder on shows like this what the real constraints are. Is the oven already hot? Do they have water simmering? Did they really only get one tomato and potato? As the tomatoes are roasting, shred your potato using a box grater. Then you want to strain off as much liquid as possible. The easiest way to do this is placing the shredded potato in a clean dish towel (or even paper towels) and twist and squeeze out as much liquid as possible. 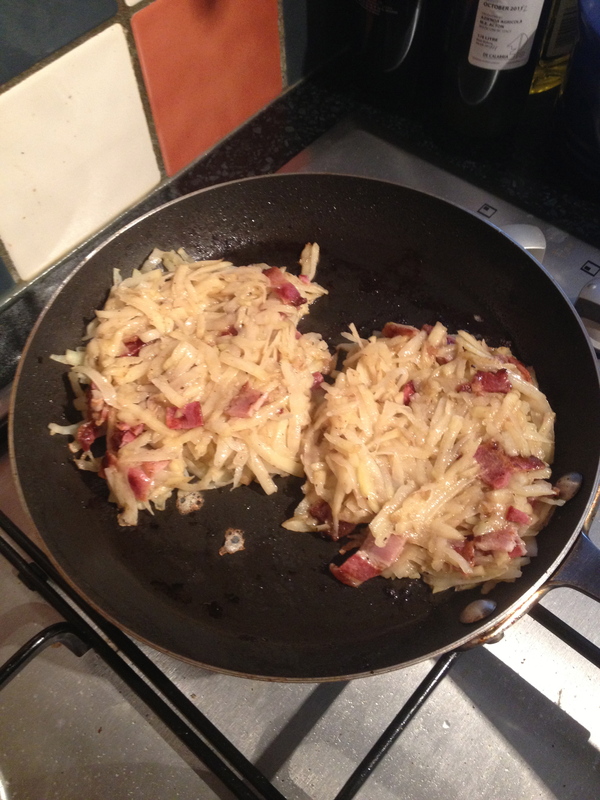 Once you’ve crisped up your bacon in a non-stick skillet, you’ll mix it with the shredded potato and one whisked egg. I don’t actually know how much bacon the contestants were allowed to use, so I used four slices. Reasonable, I think. By the way, don’t clean the pan you fried the bacon in!! The hash browns cook up in the yummy bacon drippings. Then you are going to form your potato mixture into cakes and scoop them into the heated skillet that you cooked your bacon in. 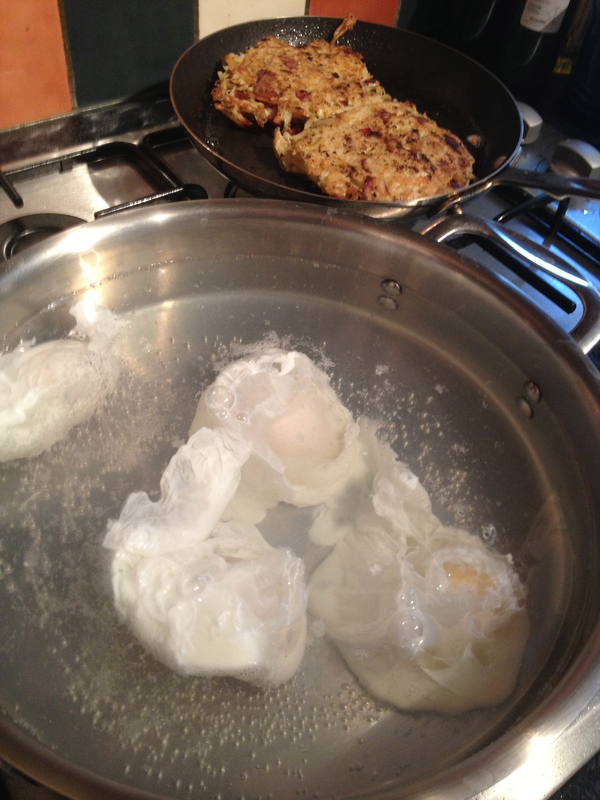 While the potato cakes are frying, poach your eggs. To learn my tricks to poaching a perfect egg, check out this post. By this time, your tomatoes will have been in the oven for about 35-40 minutes and should be soft and juicy. 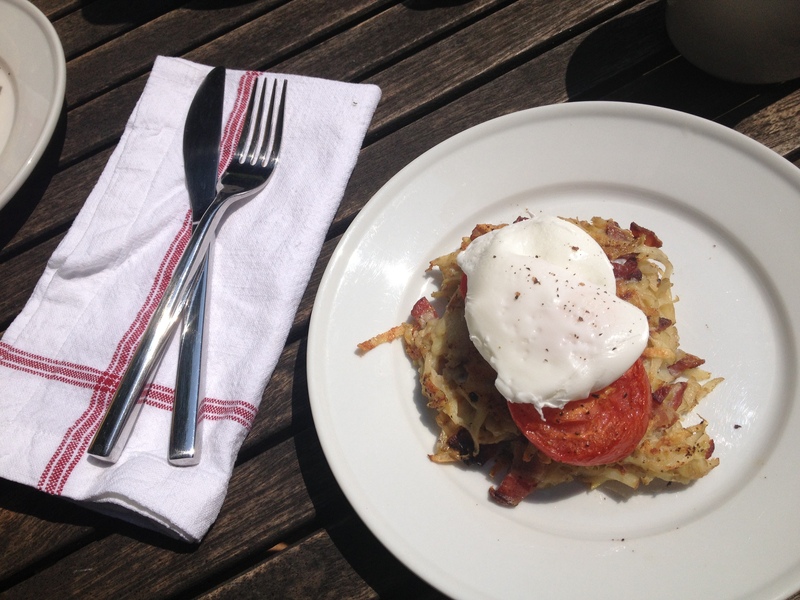 To assemble this breakfast extravaganza, top your potato cakes with two tomato halves and a poached egg (or two if you are a hungry guy like my husband). I was worried that with my ingredient limitations I might be missing a sauce, but honestly the tomatoes and the oozy yolk of the egg were all you need. I wouldn’t change a thing! Core and halve your tomatoes. Drizzle with olive oil and sprinkle with salt and pepper. Place on a baking sheet, cut side up, and roast for 35-40 minutes. Take out when they are very tender, but before the juices pop. Bring a large high-sided skillet filled with water to a simmer and add vinegar. Prepare the hash browns by crisping the bacon in a non-stick skillet. Drain on a paper towel and chop into small pieces. 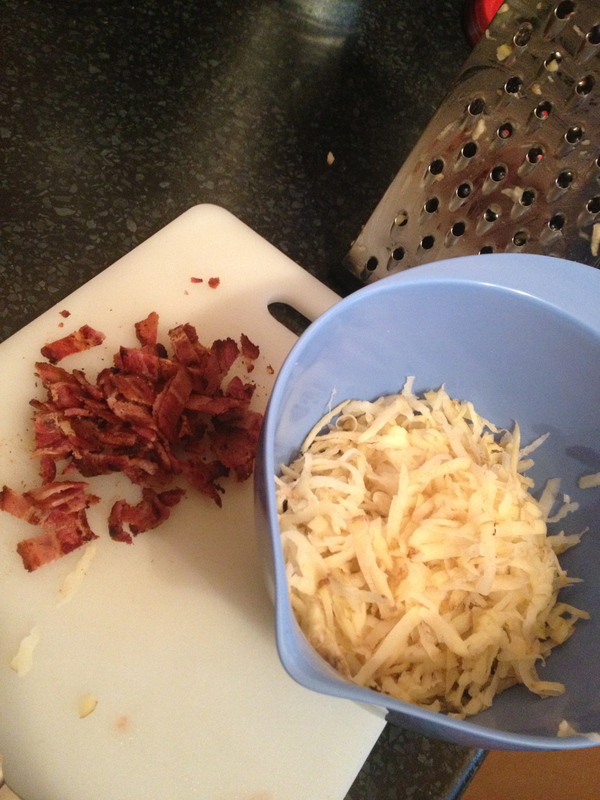 Using a box grater, shred your potato (peel first if using russet). In a clean dish towel, squeeze out the liquid from the shredded potato. 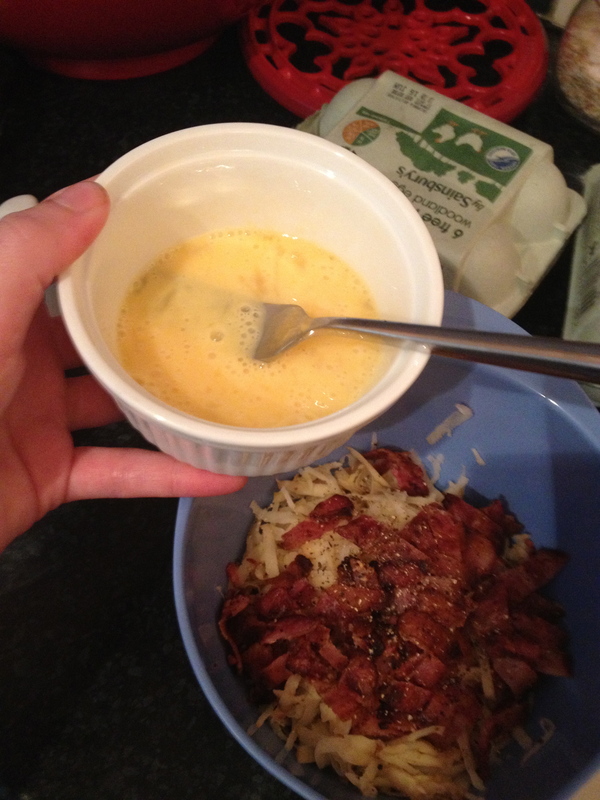 Place into a mixing bowl with the bacon and one whisked egg. Season with cracked pepper. In the same skillet that you cooked the bacon, divide the potato mixture into two cakes and cook over medium heat for 4 minutes per side, until browned and set. While the hash browns are cooking, poach the eggs by pouring each egg into a small ramekin then lower into the simmering water. Cook for 3 minutes, then remove with a slotted spoon and dab excess water off on a paper towel. 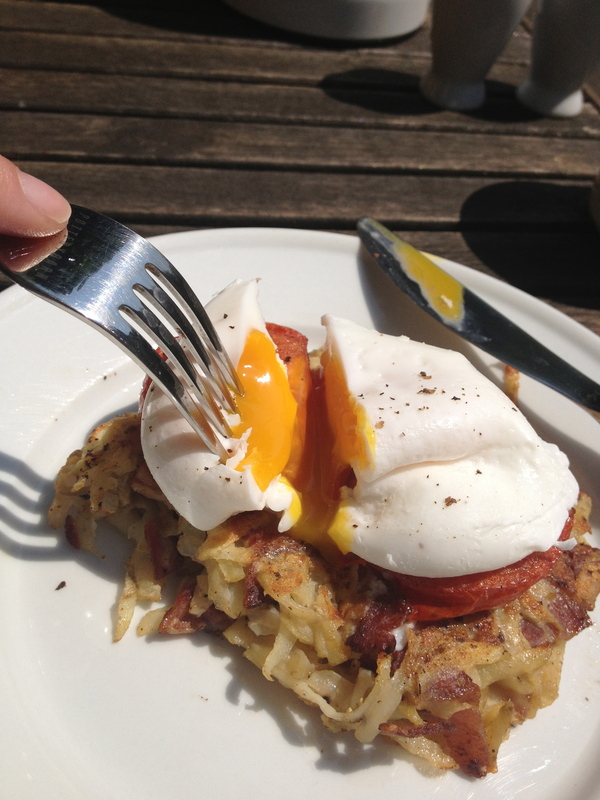 Assemble the dish by stacking two tomato halves on each hash brown and then topping with a poached egg.